The Goretide had battered their way into the Allforge, shattering the adamantine doors that made up the majority of its defense. The few defenders were quickly overrun and Grugni was forced to flee with only a handful of his followers. 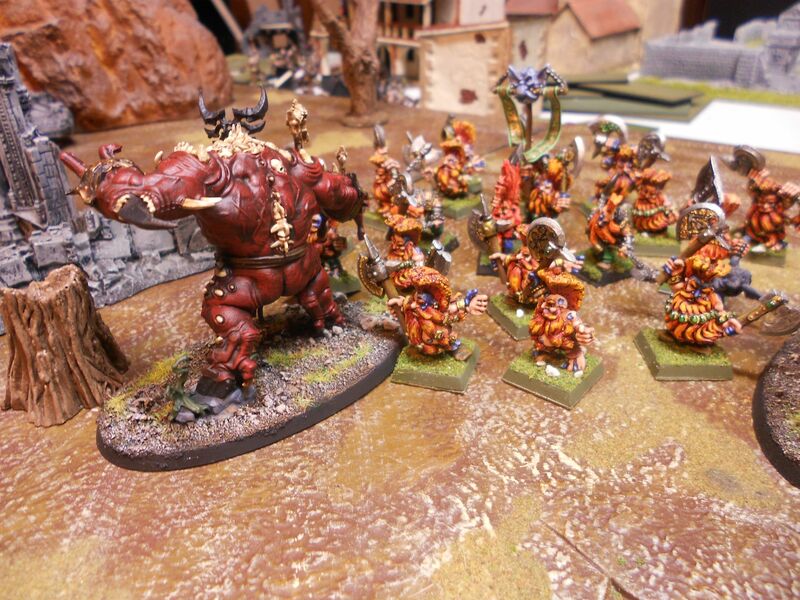 The Goretide pursued and although the Dwarf warband had a significant lead, the forces of Khorne gained on them. Small packets of Dwarf warriors would make ferocious last stands as rearguards of the Warband but it would only slow the inevitable. 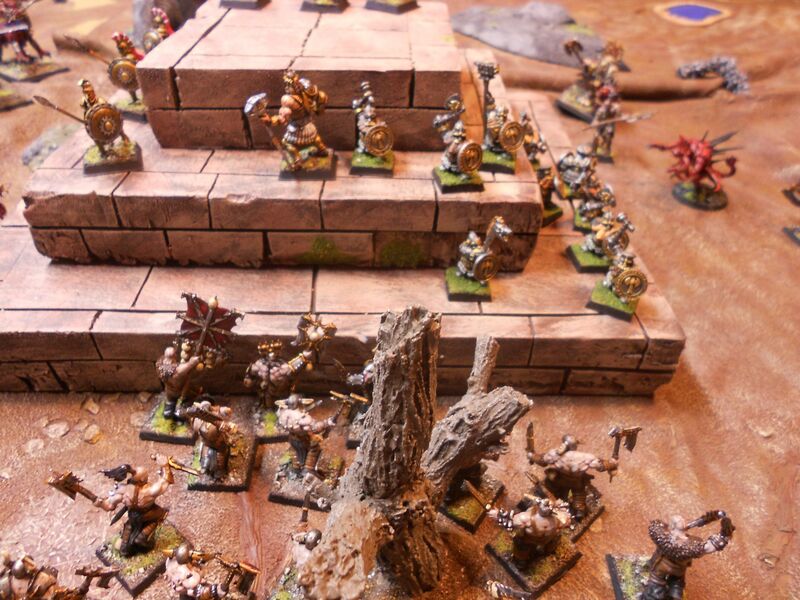 Finally Kul sent elements of his force ranging past the force while he followed, they swept around and in the ruins of an ancient town, Grugni decided to make one last stand on the Ziggurat of En-Sabbah Nur. 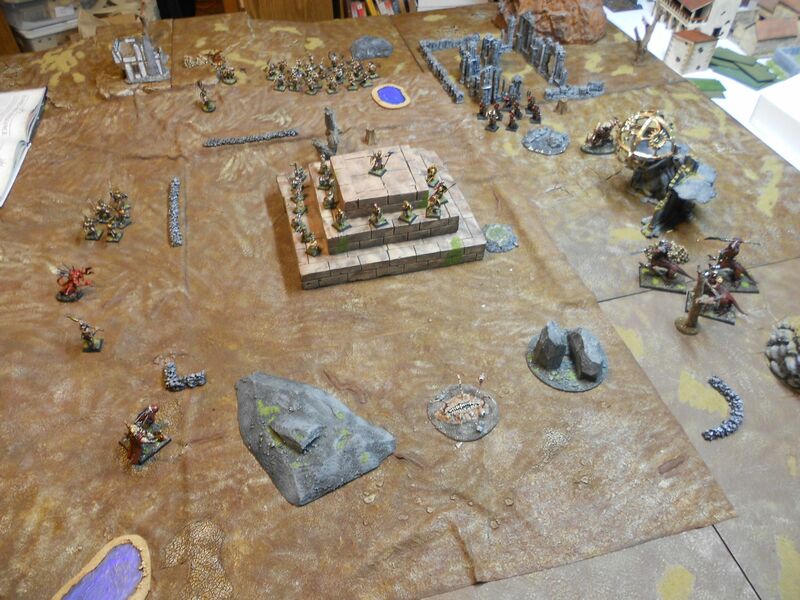 Kul's leading elements now caught up with him and had his small remaining forces surrounded. With him Grugni had his fierce Ironbreaker bodyguard and the last six of the clockwork warriors he had been making. The Gortide did not hesitate but charged straight at their quarry. Driven forward by a Bloodstoker the Reavers arrived at the stone monument first. The Ironbreakers hurled themselves into their ranks recognizing that as the weakest link in the chain of death that encircled them. Grugni moved to join them as his automatons covered the rear of his force. 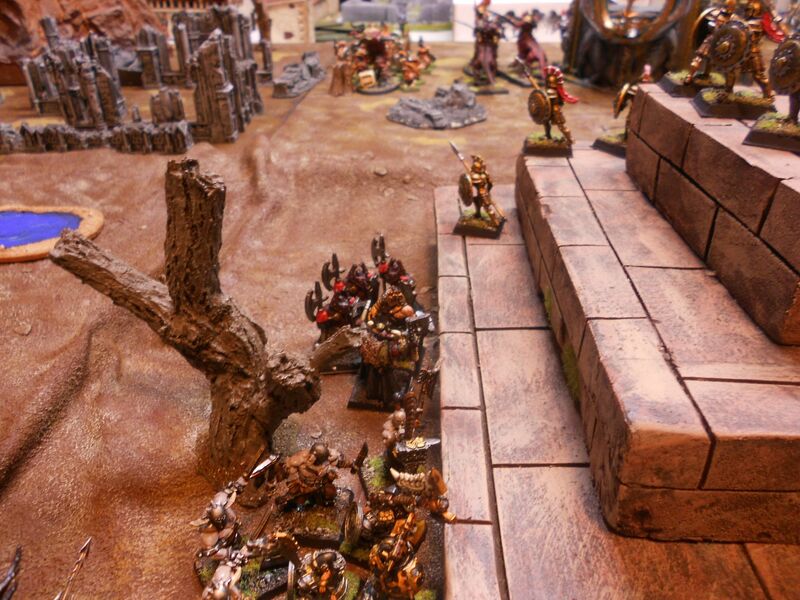 As the combat started in earnest howls went up from Kul's forces, Srini Vashta, Lord Celestant of the Realm Stormers, bounded around the walls of a large and ruined fortress. At his heels were Dwarf slayers who had been sent off to find him as the fastest of Grugni's men when the attack on the Allforge had started. They were furious at seeing so many of their fellows missing and having been left out of the slaughter. Flying above were three prosecutors that dropped towards the battlefield. A Khorgorath stormed into the ranks of the Slayers and they quickly surrounded the beast, chopping at it with their axes, hewing large chunks of its flesh as its claws redeemed dwarf after dwarf from his ancient shame. The wounds of the beast knitted as dwarfs heads were severed and swallowed by strange orifices within the beasts hands. Grugni swung his mighty hammer and the Blood Reavers were sent flying by the might of his blows. In moments the dwarf defenders, so outnumbered by their attackers, were now the majority. So quickly did he kill them that a large space was left around him filled only with the dead. 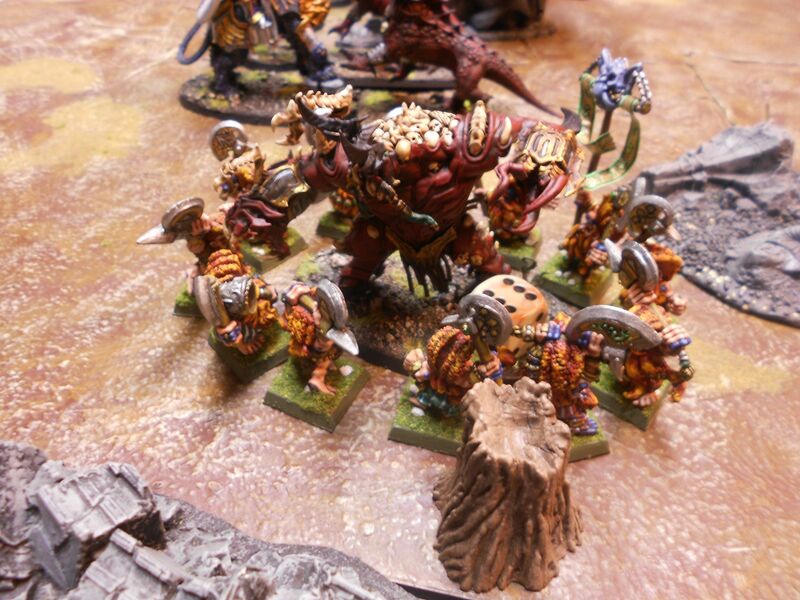 Blood warriors took this opportunity to charge the Dwarf God and their axes hewed through his armour and into his flesh, leaving his tough body cut with innumerable small slices and a couple of deep gashes. With his back against the wall he fought them off, Chaos armour proving no match for the hammer of the God. When his clockwork warriors joined in the Warriors of Chaos were quickly dispatched. Then only the Blood Secretor stood in mortal combat with the Dwarf God. Srini Vashta found himself beset by three Dragon Ogres and the two sides hewed at each other with great ferocity. 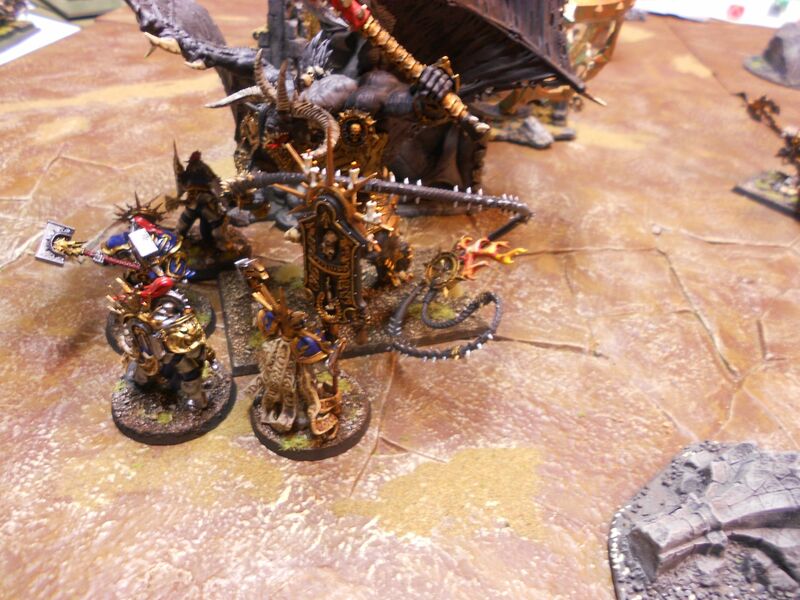 Seeing past the combat he called on Sigmar for aid and in a flash of lightning his patron sent the Lord-Relictor of the Realm Stormers and three retributors to aid the Lord Celestant. 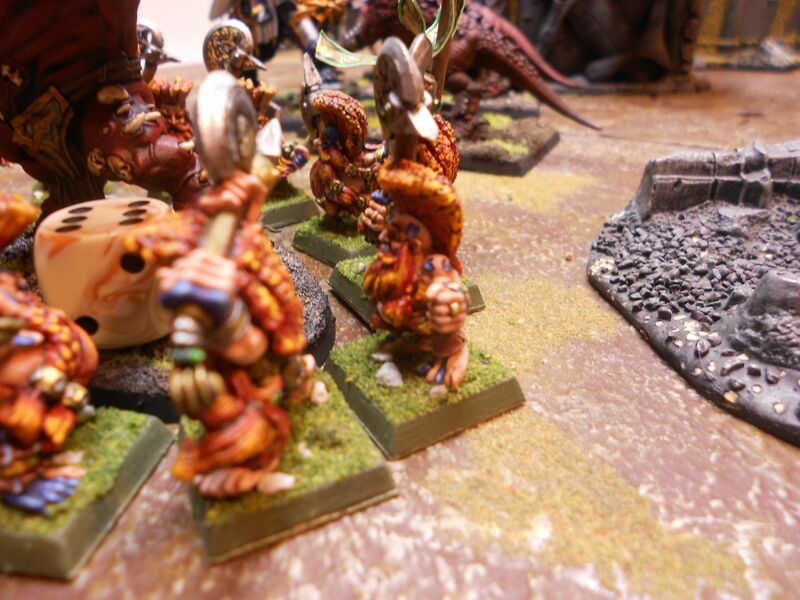 With their assistance the Dragon Ogres were dispatched in short order. 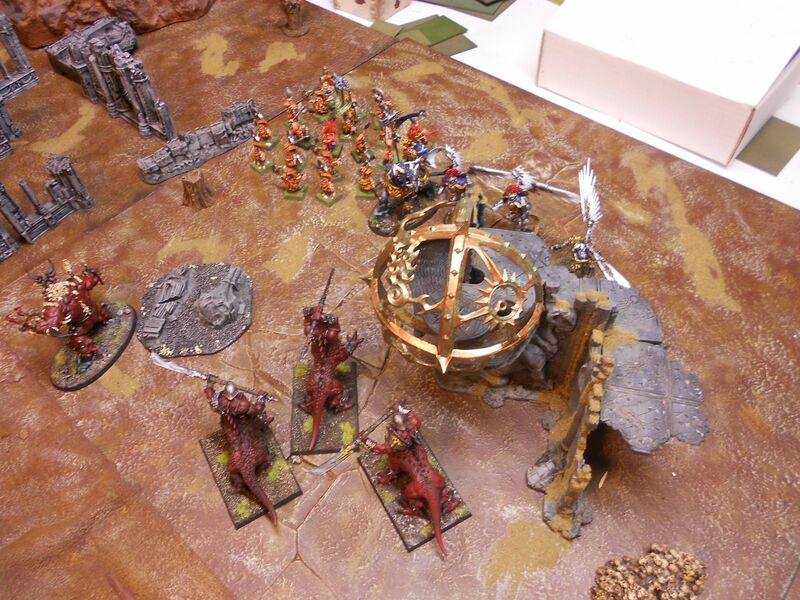 The Slayers continued to hack at the Korgorath until it was brought to its knees but still it fought on. Smashing the standard bearer of Khorne to the ground Grugni and his clockwork warriors now faced the assault of the rest of the reavers and blood warriors who had dispatched the last of the Iron Breakers. 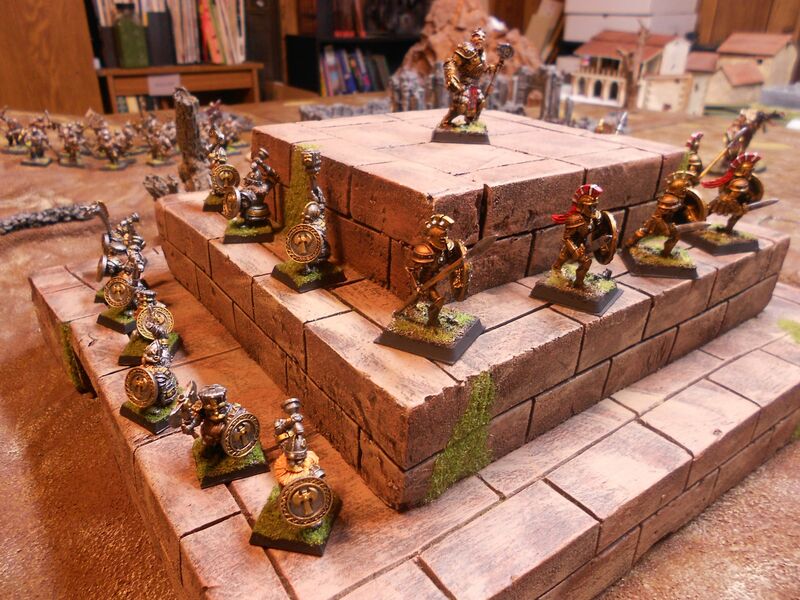 There was little contest here, the Dwarf God smashed through the ranks of the mortals with ease. Kul came around the Ziggurat to see the carnage unleashed on his forces, his dragon ogres lay dead at the feet of Srini Vashti. He called on the might of Khorne and swung his axe through the air tearing at reality itself. The air darkened and then reddened and through a spiraling cloud of blood a fierce black face emerged followed by a pair of massive wings. The monster landed in this realm followed by smaller daemons that came dripping out of the reality hole like a gush of blood from a freshly cut throat. The Bloodthirster jumped and landed in front of Srini Vashta shaking the ground. His lash struck the Sigmarite leader pulling him from his saddle before the Bloodthirster was upon him. The Dracoth's claws tore into the monster and Vashta's hammer smote with great effect. But the monsters axe came down in a number of wide arcs slicing through both man and mount. The Lord relictor and the Retributors charged forward and in a series of quick blows managed to smash the massive beast into a pile of quickly dissolving flesh. 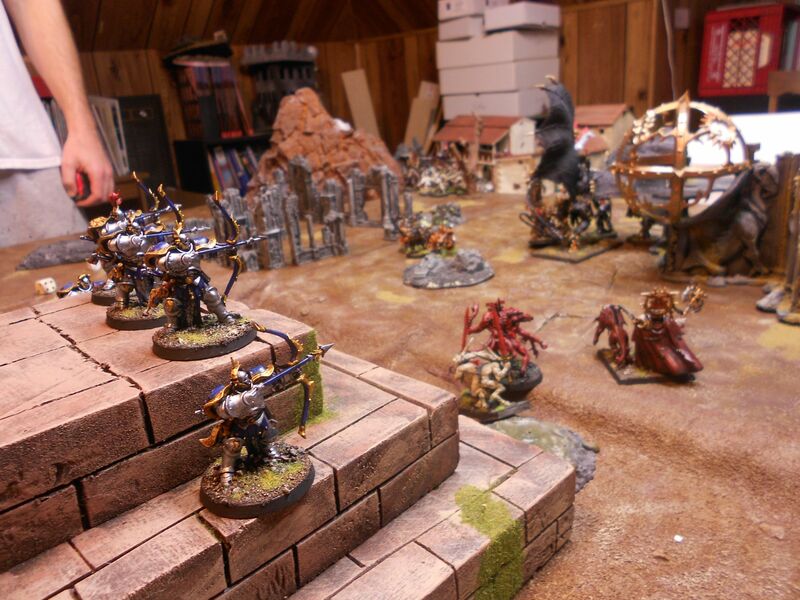 The bloodletters smashed themselves against the wall of the clockwork warriors. Grugni now had time and space to call on Sigmar for aid too. The air was once again illuminated by the blinding light of the God of Men. And more Realm Stormers were standing by his side. Massive bolts rained down among the forces of Chaos now and there were few left among the vanguard of Kul's force. He decided to cut his way out with what remained. He charged the Lord Relictor and the warrior was not able to stand before the fearsome blows of the Chaos lord. The Retributors hammers were a different story though and, as they joined in the fight, the mighty Lord's armour was not enough to stay the raining blows and it was not long before Kul lay on the ground, his vanguard shattered around him. The rest of the Goretide came up at that time but the Judicators were able to keep them at bay while Grugni and the the rest of the Stormcast made their escape. 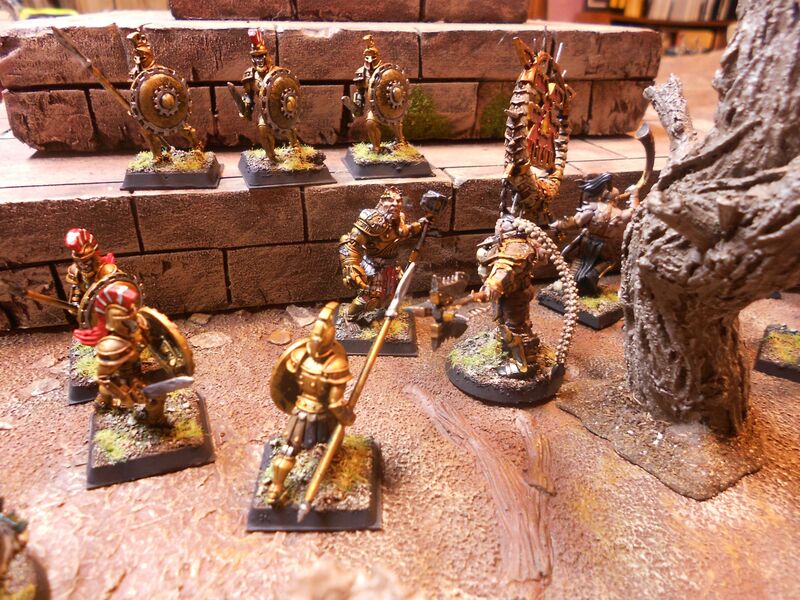 We used Croc Games Automatons and Demigod of Hephestus as the Grugni and the clockwork warriors. 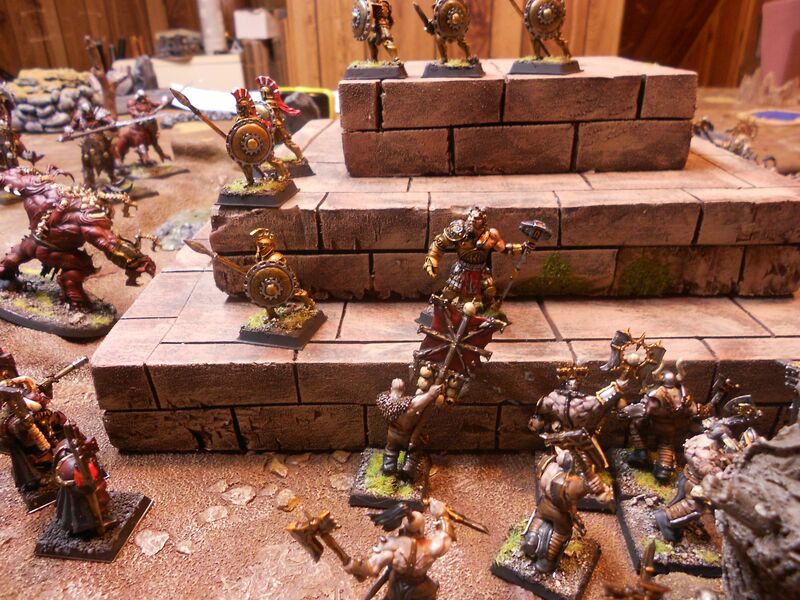 Cool battle report and the minis look great! I've said it before, and I'll say it again. Your games are what Warhammer was ALWAYS meant to be! Driven by good story, good narrative, and immersive! No hyper-obsessive stat/number crunching or "official" competitive nonsense.